As a parent, I’m sure you’ll agree that good dental hygiene starts early in life. From the myriad of choices that are available in the market today, it can be a daunting task to choose the right toothpaste for your little one. And when we say right, we mean ‘safe’ and ‘devoid of harmful chemicals’. Most of us tend to purchase children’s toothpaste that can be found at conventional grocery stores. But before you actually set out to do that take a step back and remember this handy list of ingredients that you must absolutely avoid in kids toothpaste. We’ve got to be extra careful with toothpaste, since it is something that goes is those little mouths & always carries a risk to be swallowed. Here is a quick look at what goes in commercial toothpaste. Flouride –We all tell our kids not to swallow the toothpaste but the small molecules enter the blood stream through mucous membranes in the mouth, and build up in the liver, kidneys, heart, lungs, and tissues. Besides, humans can have perfectly good teeth without fluoride. Synthetic Dyes – These are derived from petroleum or coal tar and have come under greater scientific and government scrutiny due to their carcinogenic and mutagenic activity. These can trigger a wide number of behavioral, learning, and health problems. 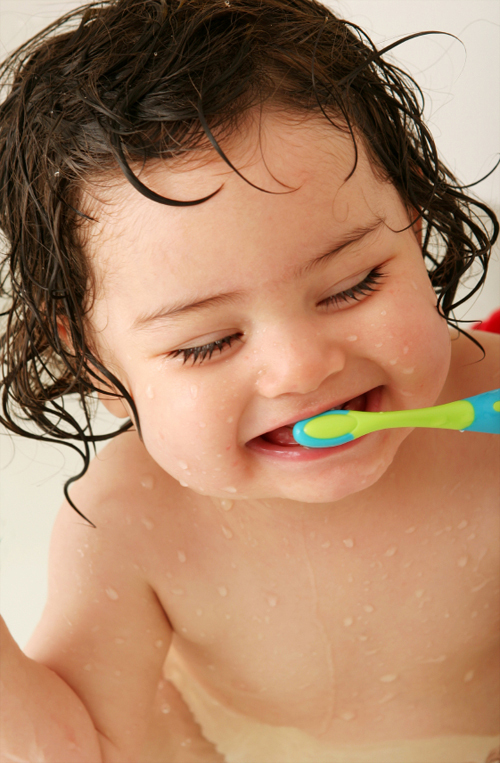 It’s about time we look for a healthier alternative to protect our toddlers pearly whites! NaturalMantra.com is happy to recommend Jason Natural Kids Only toothpaste. Made with Organic ingredients, this toothpaste is not only FREE OF TOXIC CHEMICALS, but it also has calcium carbonate, which keeps teeth clean and healthy! Make brushing a fun exercise, a little adventure you’ve set out to catch the little germies that are after the pearly whites. Trust me brushing will never really be a battle. Make your little one want to experience this adventure. Try the orange & strawberry flavours to keep the kids coming back for more! Once you get a healthy, non-toxic toothpaste, be sure to try these techniques to ensure your toddler is brushing right. 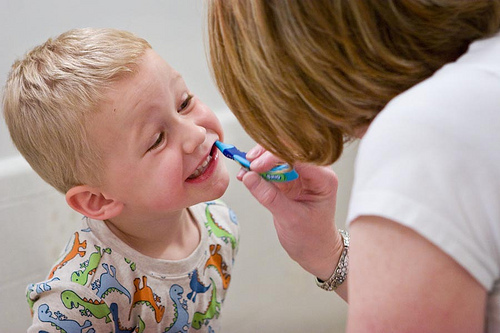 While adults need a pea-size amount of toothpaste, kids need even less. Just a smear will do. That’s it! Really! Let your kids brush their own teeth (and hunt the germies down) but assist them (always), or take turns brushing their teeth till they master the technique. Older kids may benefit from using a timer. Get them used to brushing for 2 minutes. Kids are more prone to cavities. Habituate them to use a good brushing form to clean every surface of every tooth. We recommend brushing twice a day however never skip the nighttime. Yes, it’s that important! Naturemoms.com: We thank Tiffany for her valuable insights into the harmful nature of store-bought toothpaste. Gum-disease-cure.com: Useful tips for choosing the right toothpaste & teaching children how to brush. As a parent, we always want the best for our children and when it comes to their health there’s absolutely no compromise.